QUALITY MANAGEMENT SOFTWARE THAT LETS YOU FOCUS ON QUALITY. The only Quality Management Software designed speciﬁcally for the medical device industry. The only qms software with the latest FDA and ISO best practices speciﬁc to medical device companies built into every feature. BRING SAFER, BETTER MEDICAL DEVICES TO MARKET FASTER. Update your traceability matrices in minutes, not hours or days. Then easily export records on-demand. Create design control objects, link complex conﬁgurations, and attach documents with one click. Generate design history ﬁles without searching for the required documentation. Save time with Part 11 compliant e-signatures, flexible review & approval workflows, revision control and more. Know that your team is always working off the most current version of a document. 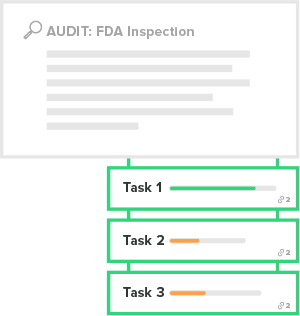 Find documentation during audits and inspections without chasing down stakeholders and documents. GAIN NEW VISIBILITY AND MITIGATE RISK. The only cloud-based risk management solution that aligns with ISO 14971. 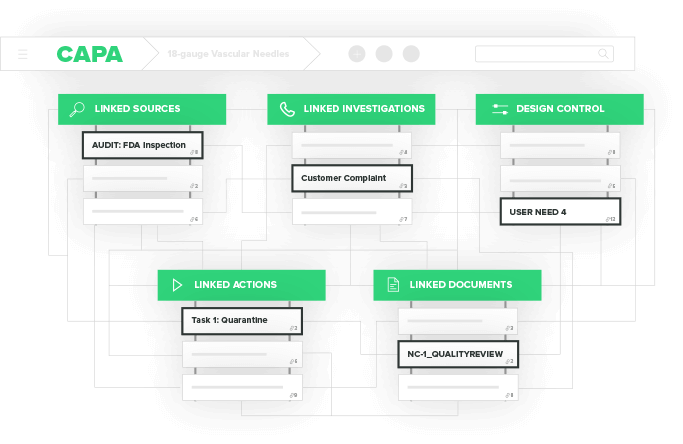 Visualize the relationships between requirements, risks, and veriﬁcation tests. Keep your risk management ﬁle up to date and avoid costly rework by mitigating potential risks. Want to learn more about our Premarket QMS Software? Let us show you around Greenlight Go. Remain compliant and manage risk in the face of ISO and FDA changes. Identify CAPAs, discover their root causes, resolve them, and report outcomes. Manage feedback and complaints, escalate when appropriate, and update your risk management ﬁle. Conduct internal audits and always be ready for external audits and inspections. IDENTIFY AND ADDRESS ISSUES FASTER. Easily trace CAPAs back to their root cause, even if it’s in design control. See quality issue trends in real time and correct them before they become a regulatory issue. 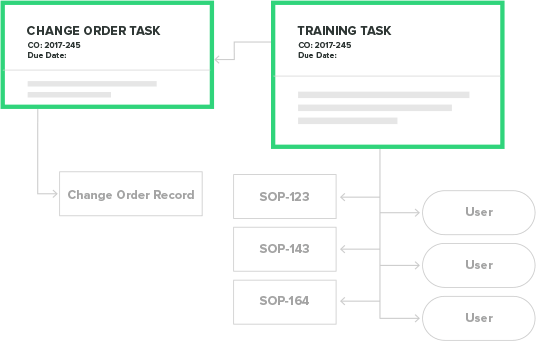 Assign CAPA-related tasks to your team, include guidelines, and track everyone’s progress towards due dates. Access your procedures and present them to the FDA in a couple of clicks. Manage tasks, follow ups, communications, and any actions that result from audit ﬁndings. Escalate high-risk ﬁndings for investigation and monitor low-risk ﬁndings for recurrence. 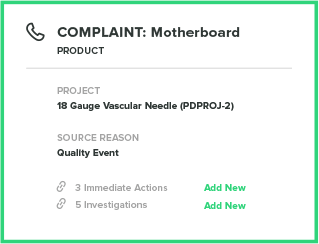 Create and share ﬁnal audit summaries with a single click. STREAMLINE FEEDBACK AND COMPLAINT PROCESSES. Quickly determine whether feedback requires immediate action or the issuing of a CAPA. Ensure your customer complaint processes are compliant and easily audited by regulatory bodies in any country. Optimize customer feedback management and oversight for faster response times. REDUCE CYCLE TIMES AND ASSOCIATED RISKS. 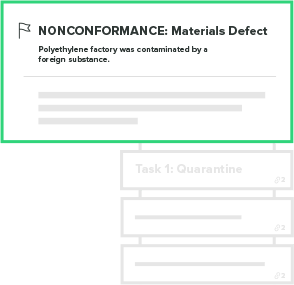 Easily capture defect details such as part, quantity, failure type, and severity. 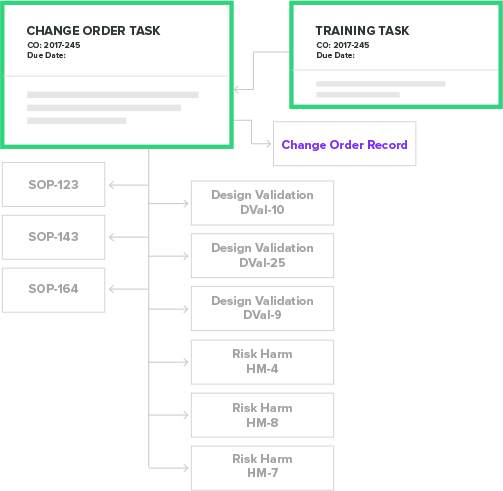 Adjust workﬂows based on risk and loop in the right team members and suppliers to resolve issues quickly. Escalate the right defects to CAPAs at the right time. UNDERSTAND AND MANAGE THE IMPACT OF ANY CHANGE. Identify scope, understand impacts, justify the change, and document decisions before anything is implemented. Link any item within Greenlight Guru including change records, documents, risks, design controls, CAPAs, customer complaints, audits and nonconformances. Realize full traceability and auditability throughout. THE RIGHT TRAINING TO THE RIGHT PEOPLE AT THE RIGHT TIME. Assign training to individuals, set due dates, and keep track of tasks to ensure training completion. Provide links within the software to related documents, videos and presentations so all required training material is easily accessible. Know what training is in process, who has completed it, and view all historical data to ensure the right people received proper training. The software allows me to mitigate my regulatory and compliance risk, I have been able to implement a world class eQMS that rivals the largest companies in med device. Greenlight has the best in class support, it is both software and service. I have an eQMS that rivals much larger companies in my industry. Want to learn more about our Postmarket QMS Software? Let us show you around Greenlight Grow.